Discussion in 'Birthing, Weaning, and Raising Young Sheep' started by shepherdO, Mar 17, 2019. Anyhoo, ewe has a huge udder, but is extremely thin - far thinner than last year. I don't think she was aggressive enough at the feeder, and I didn't really notice until this week. Stupid me. Can sheep have 'twin lamb' post lambing? Is she just tire? Should I be giving her propylene glycol or whatever it is? Also, any suggestions re: how to manage quads? My initial thought is, because they're so small, she's a katahdin and she has a great udder, I will leave them all with her and supplement them. That way i don't have a full-time bottle lamb, they get the benefit of being with their mum and I can just watch to see their progress. I don’t have sheep, but I do raise dairy goats. You can certainly have ketosis after kidding/lambing. If she were a goat I’d start slowly increasing feed and giving the best hay I can find. Dyne is a good product, a little pricey but worth it. Dale HWA, mysunwolf and babsbag like this. I'm going to get some alfalfa pellets tomorrow when the feed store opens (it's nighttime here now), but I have some alfalfa hay. A bit stalky, but there's lots of good leaf in it, even it kind of falls everywhere... I'll put it in a bin beneath her regular hay feeder to the leaf is collected and she gets as much as possible until tomorrow. Dale HWA and Baymule like this. I had a ewe have triplets and she never missed a beat. The littlest one died, but she raised the other two and had a bag like a Jersey cow. She always twins and always has LOTS of milk. I feed the ewes a 14% pellet and plenty of hay, I also keep mineral in front of them. I buy Dumor sheep mineral at Tractor Supply, they eat it like candy. Dale HWA and B&B Happy goats like this. Here is the little two lb ewe. Dale HWA, journey11, Baymule and 4 others like this. A ewe is equipped to feed two lambs. Fit, young ewes with good body score and excellent appetites can sometimes manage triplets (personally I always take one off her as the smallest is not likely to thrive). Quads will not do. Ewes, particularly older ones, are often tired and lethargic the day after lambing (giving birth is exhausting and the hormonal changes after giving birth often causes a down feeling!). Personally, I'd take two lambs off her and feed the ewe copiously. . The little lamb is gorgeous! (She's a whole lot bigger than my little lamb in my avatar was, though. LLeila weighed under a pound. She now weighs nearer to 150lbs). 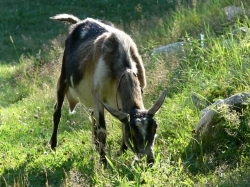 Dale HWA, B&B Happy goats and promiseacres like this. I would probably let them get a few days of colestrum then pull the ewes to bottle feed. Watch the ewe for diarrhea as you add to her diet. Hmmm... I plan to buy one of those bucket multi-lamb feeders today and see how it goes. I'm going to try supplementing all 4, particularly the little ones, for a week or so and see how things go. I have two weeks' holiday starting today, so my son and I will be able to feed multiple times per day, so I think it's worth a shot just to be around the mum all the time. I had a doe have quads last year and now I have several. I fed them extra twice a day to take the stress off mom and I ended up selling one early on. She produces over 12 lb of milk a day so she could have raised her own kids, but why put that much stress on her when I can add extra milk and she doesn't have to be stripped as bad and it helps them stay with a mom. I would agree it's quite possible it's time to ketosis treat her with a little bit extra you can use propylene glycol or you can make some magic with corn syrup and creamed corn.